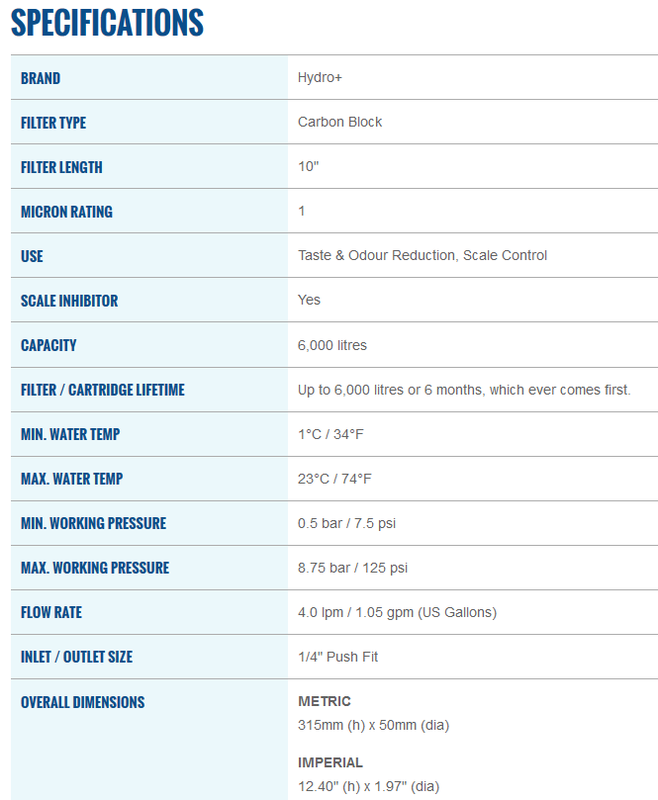 The H15PA filter is similar to the H14PA but also boasts scale inhibitor. It has a capacity of up to 6,000 litres; integral 1/4" push-fit connections and is suitable for use as an inline fridge filter, water cooler or under-sink filter. Genuine John Guest push fits. Europe's best selling range of inline filters. This filter is currently available at a reduced price of £18.19 with free carriage (UK mainland only). A 6 month filter change is recommended by the manufacturer. LG 9808 BL9303 plus many more! Carriage is free of charge to UK mainland. I use only these filters for both my ambient water filter tap and my chilled/boiling water unit, changing every 6 months as recommended. Great service from Andrew’s Water. Compact, does a great job of providing purified water, simple to fit / exchange. Great filter! Always competitively priced with fast, well packed and reliable delivery. Click the button below to add the Hydro+ H15PA - 1 Micron Carbon Block / Scale Inline Filter with 1/4" Push Fit Connectors to your wish list.